I looked out the window this morning and there was a mama deer and her baby in my front yard. By the time I grabbed my camera and quietly snuck outside, they had walked down the road a ways. and my friends enjoying their veggie crepes. We ended the day by stopping in at The Artful Ewe and lusting after their piles and piles of wonderfully dyed fiber and yarns. We even got to meet Grace, Heidi's whippet puppy. Look at that cozy bed. That's one lucky dog! 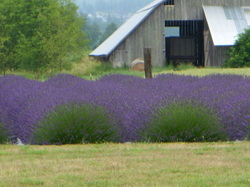 My friend and I went to the Sequim Lavender Festival on the Olympic Peninsula in Washington. Sequim (pronounced "squim") is a picturesque little town on the Straits of Juan de Fuca. Sequim is located downwind of the Olympic Mountains so that it is in a rain shadow and has the lowest annual rainfall of all the small towns up in the Pacific Northwest. The annual rainfall is that of Los Angeles. It's our version of a sun belt. Not this week however. We have been in the middle of a freaky rainy and cloudy week here, so during the festival we were treated to cool temps and and occasional light drizzle. For me, it was perfect weather. I don't like being hot hot hot. 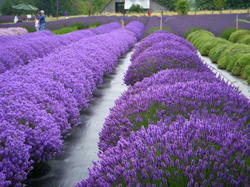 For a small fee we had admission to the eight area lavender farms participating in the festival. This included free use of the shuttle buses that made round trips to two farms each continually through the day. At each farm there were various things to do. And, stuff to buy, of course. One of the farms we visited had a U-Pick option so you could go into the fields and pick your own lavender bundle. Purple was everywhere and I was surprised to see pink lavender also. So beautiful. And the aroma! 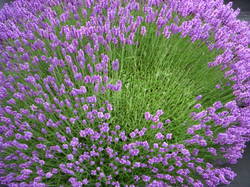 This is a shot of a lavender bush that has started to be harvested. 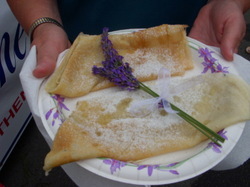 I wanted to try lavendar flavored food, so I started out with a crepe dusted with lavender sugar and topped with a small lavender bouquet. It was so pretty on the plate! I've seen different recipes for lavender sugar. Some suggest putting a tablespoon of dried lavender blossoms in a container with 4 cups of sugar and then letting them sit for a few weeks. Before using, sift out the flowers. I've made it by taking a few teaspoons of flower buds and a couple cups of sugar and running it through the blender. I like the little hit of lavender you get this way when you bite into a small piece of the flower. We made our way out to the Angel Farm and then enjoyed a glass of Lavender Champagne with a Lavender Sausage. For another sweet bite, we tried the White Chocolate Lavender Cheesecake with Raspberries. It was to DIE for. 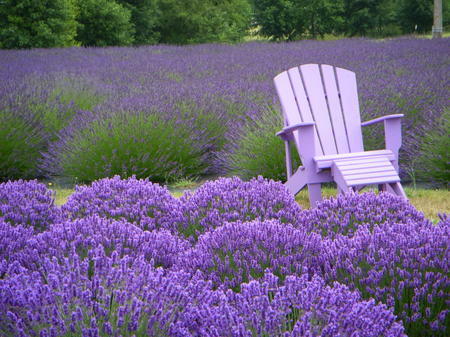 At this farm we learned that all lavender is not appropriate to cook with. The dishes were all made with "culinary" lavender, which is a variety called Provence or Royal Purple. 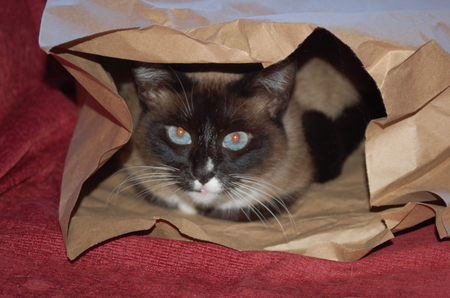 This variety has less camphor and so the flavors aren't as pungent and more subtle. That is one thing that I have decided. Subtlty is the key when flavoring with lavender. If it's too strong, it just tastes like you're eating perfume. Finally, before we left for the day, my friend Patrice got a Peach Lavender ice cream cone and I tried the Lavender Cheesecake ice cream. Both were really, really good. The Angel Farm had a large barn with chains hanging from the rafters. 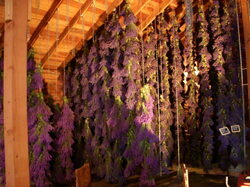 Bundles and bundles of lavendar were hanging from them, drying. They had a fan blowing on them to help the process along. And the aroma...wonderful. We visited two farms on the bus, Angel Farm and Lost Mountain Lavender Farm, but then decided to drive to the remaining farms we visited. The wait for the shuttle bus wasn't bad, but we were running out of day and thought we'd catch one or two more on the way out of town. The last one we went to was Jardin du Soleil. They were all different, and the activities they had were different. When I read the brochure, I saw that the Purple Haze Lavender Farm had lots of fibery things going on, from needle felting and wet felting to kumihimo. Next time I go, I'll have to read the brochure to check out the farm activities. We just hopped on the first bus this year. 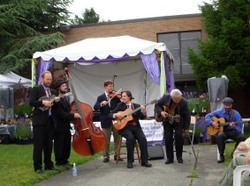 Before we left the festival, we enjoyed the tunes of a gypsy jazz band called Hot Club Sandwich. They were really good and they took it in their stride when the entire festival lost power, they just left the stage to get a little closer to the audience and ended up giving us a true acoustic performance. The entire day was very nice. I was glad the weather was cool and the crowds weren't too thick. I would definitely go again, on a Friday, and take my to the farms instead of the bus. The lavender was beautiful and very fragrant and it was a picture takers paradise. When I go again, I'll bring my better camera. If you ever find yourself in Silverdale, WA in the summer, stop by Linda's Knit and Stitch in Old Town. They have the most beautiful rose garden. This is just a portion of the garden. 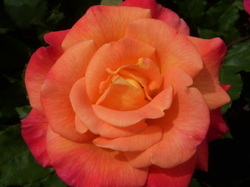 Linda's husband Gary has the green thumb and his roses are spectacular. He has also started a patch of dahlias that are equally stunning. 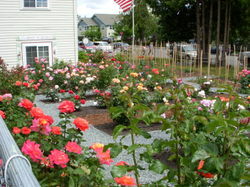 Gary has built a nice walking path through the garden and has labeled all the roses with their names. Beautiful. Color, color everywhere. 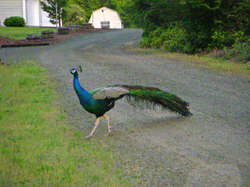 Our neighbors have a peacock that I have never seen out until this morning. He was walking the road when I left for work at 6 am. I tried to get a better picture and followed him down the road a bit, but I think I started freaking him out and he ran faster and faster, all the way crying his annoying cry. Very pretty though..I would like to see him display his tail feathers. This is the 8th or 9th day school has been closed in the Pacific Northwest because of weather related conditions. The roads are icy and the snow is making moving around very dangerous. Looks like another stay at home day for me.